Take a dip in the sparkling waters of the private swimming pool. With an outdoor kitchen, barbeque and wet bar, guests can enjoy the glorious warmth from sunrise to sunset. Relax on the covered alfresco lounge area, or take in the gentle sea air from the comfort of your very own balcony. The property offers plenty of sun loungers and boats a children’s playground to keep the little ones entertained. Indoors, guests will have full use of the home cinema, bar, billiards table and Wi-Fi throughout. 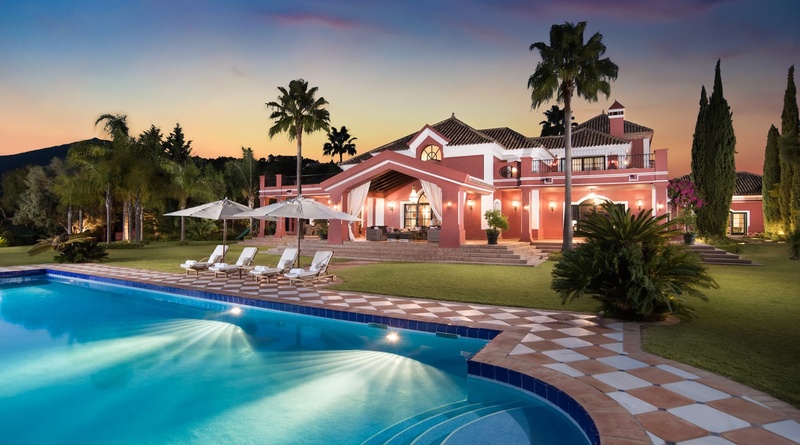 Other services at Casa Grandioso include an elevator, a sauna and a fantastic wine cellar. Sophistically decorated throughout and offering guests a fully equipped kitchen with giant centre island means the whole party can come together in the evening and enjoy an impressive dinner in the dining area before moving onto the lounge and bar area, perfect for entertaining into the night. Six lovely ensuite bedrooms and the Guest House accommodate up to 12 guests in total.